What are the different kinds of locks? This blog will talk about all things locks. This includes answering your queries about What are the different kinds of locks? In the second part, we will try to answer your queries about what are the different categories of locks. Hopefully, at the end, you will have a better idea, before making a purchase. Please remember that you can always call our expert locksmiths for more information and guidance. We are there to help you. 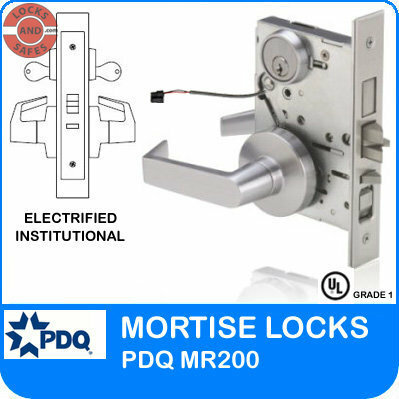 Mortise locks are heavy duty locks designed to be used in commercial applications, where they can withstand frequent usage without breakdowns. 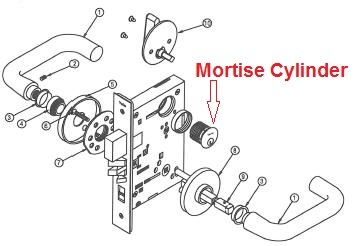 A Mortise Lock, as the name suggests, implies that the lock is "Mortised" into the edge of a door i.e. it requires a pocket to be cut into the edge of the door. A Mortise Lock has many different components including the mortise lock body, trims and escutcheons, inside and outside levers. The lock also comes with a Mortise Cylinder, which threads into the mortise lock body. The Mortise cylinder has small groove or milling on its edge. Once the Mortise cylinder is thread into the Mortise Lock, it is fastened with two sets of screws which lock the cylinder in its place. The inside handle of the mortise lock mostly allows free turning, to enable fast exit in the event of a fire or emergency. In some cases, the inside lever might be rigid. 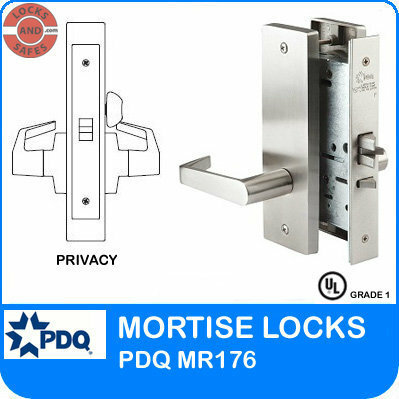 One example of this is the PDQ MR138 Mortise Lock. 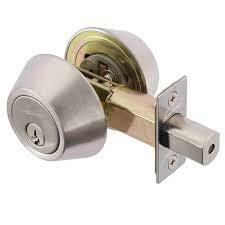 Mortise locks have an added advantage that they can be easily rekeyed, to accept almost any key. This is because the mortise cylinder is extremely easy to remove and replace. To remove a Mortise cylinder, simply loosen the two screws and unscrew the cylinder. In this way, virtually any mortise lock can accommodate almost any type of key, or lock configuration, making many mortise cylinders virtually interchangeable! When changing a Mortise lock, say for example, you want to replace your old Schlage Mortise lock with a new cheaper, but high quality PDQ Mortise lock, and yet you want to be able to use the old key that worked with the Schlage Mortise Lock. In this case you will refit your door with the new PDQ Mortise lock, but you will fit the lock with the old Schlage Mortise cylinder. You will have to remember to change the cam in the Schlage lock to that of a PDQ cam. Mortise Locks generally come with two different types of trim styles, either a Sectional trim or an Escutcheon Trim. They also come with different designed levers and knobs. The cylindrical lock is the most common type of lock. The lock requires two holes to be bored into the door, perpendicular to each other. The lock itself fits into the 2-1/8" hole bored into the door while the latch fits into a 1" hole bored on the side of the door. 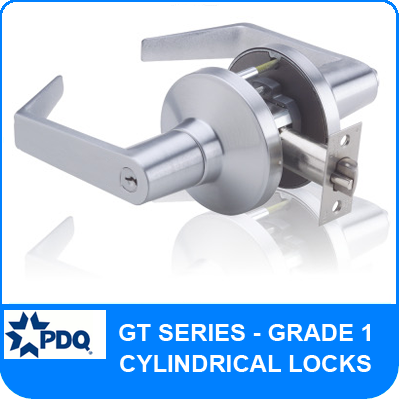 The cylindrical lock consists of a primary trim which has a fixed chassis, an inside trim which is mounted on to the chassis, and a latchbolt which goes inside the smaller bore but is contained in the portion installed through the cross bore. The chassis contains retractors on which the latchbolt is mounted and interlocks with the retractor. Now when the lever or the knob is moved, the latchbolt retracts, and this causes the door to open. 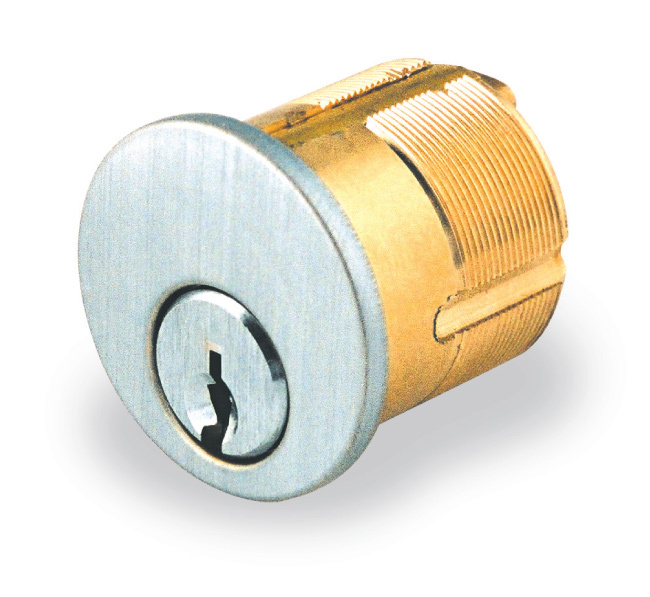 Cylindrical locks come with both levers and knobs. The lever locks have additional holes drilled for standoffs that act as reinforcement. Cylindrical locks are very convenient and easy to install. Installation is as simple as drilling two holes in the door. Once the holes are drilled, the different parts of the locks are pushed or fitted into the door, and secured with screws where required. 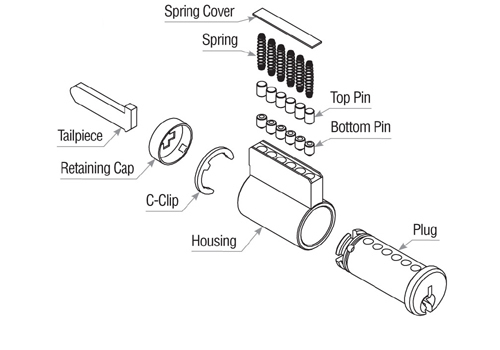 Cylindrical locks come in a wide variety of makes. There are models available for residential purposes, for light commercial use and there are also heavy duty, high grade cylindrical locks for high usage commercial applications. 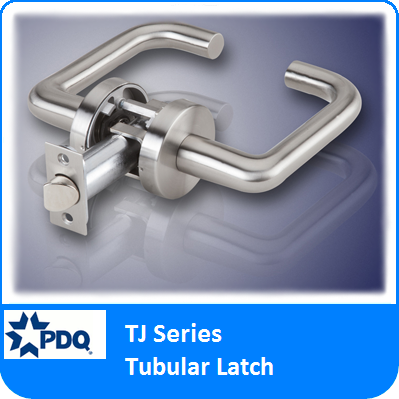 Tubular Locks - Tubular Locks are a light weight version of cylindrical locks. 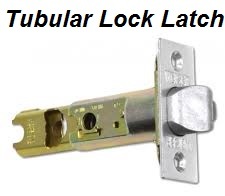 Like the cylindrical lock, the tubular lock consists of two trims, the inside trim and outside trim, and a latchbolt. 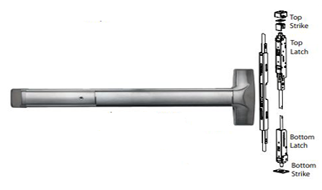 But unlike the latchbolt of the cylindrical lock, which is mounted on the retractor, the latchbolt of the tubular lock goes all the way through the mounting hole, and both the inside and outside trim attach directly to the latchbolt. Once the trim's are attached successfully to the latchbolt, and the lever or knob on the trim is rotated, the latchbolt retracts. 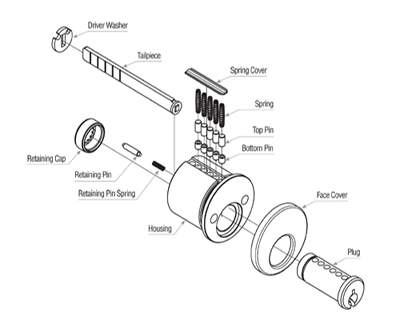 Tubular locks are are mostly used in residential applications. 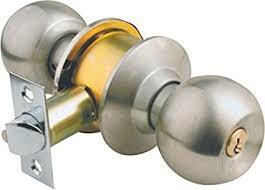 A deadbolt is a lock bolt which can be moved to an open or closed position with either a key or by turning a knob. Deadbolts provide much higher security than standard locks which operate using spring latches, since these spring latch locks can be opened forcefully using keys or knifes. In most cases, deadbolts are used in conjunction with a spring latch lock for extra security. Deadbolts come with either a single cylinder or a double cylinder. The single cylinder deadbolts can be opened with a key from only one side, while a knob is required to operate it from the other side. The double cylinder deadbolts can be opened with a key from both sides. Double cylinder locks provide more security than single cylinder locks, since the lock cannot be opened by force by twisting a knob. On the other hand, the double cylinder deadbolts can prevent people from exiting the building, if they do not have keys. Deadbolts are generally made of heavy duty metals like steel, bronze or brass and are thicker and heavier than spring latches and protrude deeper inside the door frame. Apart from turning deadbolts with a key or knob, the more advanced keyless deadbolts come with an automated motor which moves the deadbolt, after a valid entry credential such as a pin code, a fingerprint scan, or a keycard is authenticated. 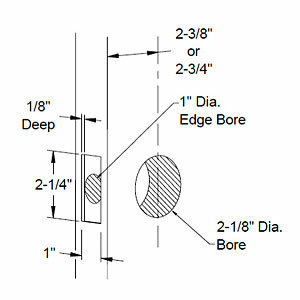 Regular Bolt - The regular bolt has a faceplate which is installed by removing/chiseling out the area around the crossbore (or the bolt hole). The faceplate is screwed with two screws and this keeps the bolt in place. Drive-In Bolt - This bolt is installed by tapping the bolt into the crossbore (or the bolt hole). There is no chiseling involved and the bolt is not required to be screwed in. Once the bolt is in place, the knob or the lever is installed. As such, the Drive-in Bolt is easier to install than a regular bolt. In some cases, both the regular bolt and the drive-in-bolt can be adjusted to fit doors with 2 3/8" and 2 3/4" backsets. What to look for when purchasing a Deadbolt? Strength of the Deadbolt - Deadbolts can vary from medium strength, to high strength to extra heavy duty strength. For premium security, it is ideal to purchase a deadbolt having an ANSI Grade 1 Certification. ANSI or the American National Standards Institute develop standards for different industries. The Grade 1 certification for deadbolts puts it at the highest quality and strength. For a deadbolt to be certified Grade 1, it is necessary that it has been tested for 250,000 open/close cycles, has a bolt that projects 1 inch into the door frame and can withstand at-least 10 hammer blows without breakdown. Another compliance to look at is the Underwriters Laboratories (UL) listing. UL listed deadbolts signify that they have passed stringent testing for drilling, prying, picking etc. Also keep in mind what type of a deadbolt will fulfil your needs, whether it is a single cylinder, a double cylinder or keyless deadbolt. Lastly it is important to keep in mind the location where the deadbolt will be installed. Will the deadbolt be used in an office or a commercial building, or will it be installed to provide security to a residential or multi-family apartment complex, is an important question when selecting a deadbolt. Once you have purchased the deadbolt, it will be wise to ensure that it is installed properly. Things to look at when installing a deadbolt are whether the strike has been properly secured using long screws and whether the lock has a reinforced strike plate with offset screw holes. In the event of forced entry, these extra protections will make the lock stronger. A Mortise Cylinder is a type of lock cylinder that is used in a Mortise Lock. 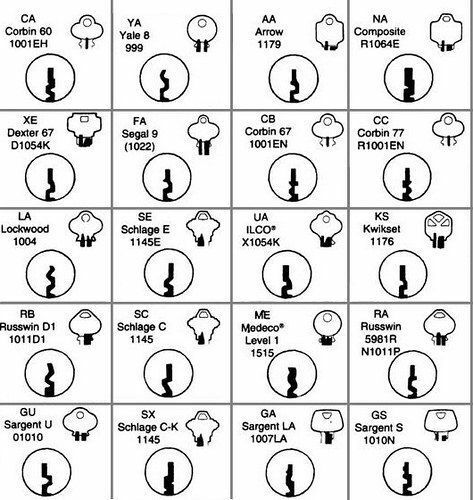 The mortise cylinder houses a Plug, which is precision machined or "broached" to accommodate various "keyways" (see below). The keyway of a lock is what allows the lock to only pass specific types of keys. There are many different keyways. Some keyways are restricted by the factory so that distribution of keys is Limited to the original owner of the key system. 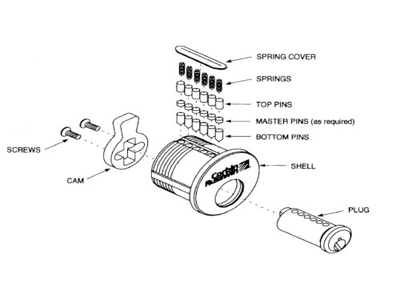 Screwed to rear of the cylinder is a part called the tailpiece or Cam. 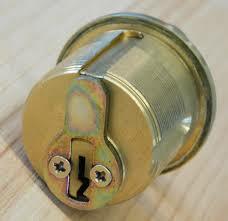 A cam is a small flat metal piece fixed to the mortise cylinder and requires a key to rotate it. The cam is held in place by two screws. When a valid key is inserted into the keyway, the key can rotate and this rotates the cam. In the process, it actuates the latch of the Mortise Lock. The mortise cylinder is generally 1.150" in diameter. The lower part of the cylinder has a threading with a Thread Pitch of 32 UNS . Mortise cylinders are easy to install. To install the cylinder all you have to do is to slide it into the Mortise Lock's case and then rotate it (similar to how you would rotate a lightbulb). A rim cylinder is a type of lock cylinder. The rim cylinder houses a keyway or a Plug, in which a key can be inserted. The keyway of a lock is what allows the lock to only pass specific types of keys and this allows them to be keyed to an existing master key system, or just a simple Schlage key. There are many different keyways. Some keyways are restricted by the factory so that distribution of keys is Limited to the original owner of the key system. The rear of the cylinder has a tailpiece that is connected to the cylinder on one end and usually actuates some sort of a lock. It may be an Exit Device or it could be a Jimmyproof deadbolt or a rim lock. They are sometimes even used in night depositories, or unusual applications, since they're so universal. If the tailpiece is too long, it can be cut and shortened in length. The cylinder is pulled in from the back through screws which not only hold it in place, but also provide more security than mortise cylinders (since it will take time to unscrew and wrench it off). 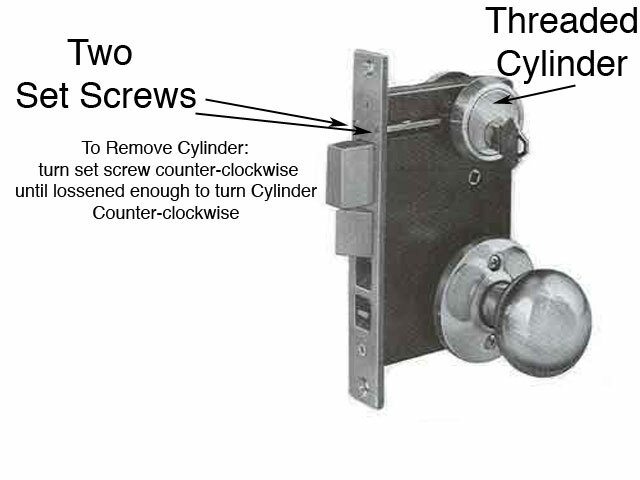 The key-in-knob and key-in-lever cylinders go directly inside a door knob or door lever respectively. If you are putting your key inside the knob or lever of your lock, then chances are that you are inserting your key into a key-in-knob cylinder lock or a key-in-lever cylinder lock, depending on whether you have a door knob on the lock, or a door lever on the lock. These cylinders are also referred to as conventional cylinders and are often manufacturer specific. 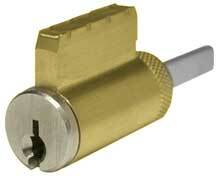 Key-in-knob/lever cylinders can be keyed alike or master keyed, so that you can use one key to open many doors. Also, in many cases, a cylinder made by a particular manufacturer can be put inside the lever or knob lock made by different manufacturer. This would allow you to create a master key system with a PDQ cylindrical lock, to be integrated into an existing master key system without regard to the manufacturer of the existing system. 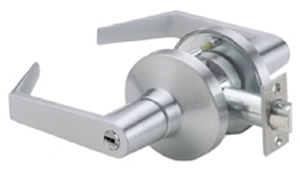 Locks containing key-in-knob or lever cylinders are ideally suited for light weight applications, where usage is low, such as small stores, or residential purpose. 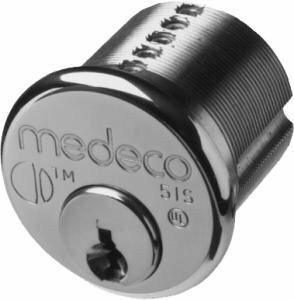 The cylinder contains a set of pins, which if not aligned properly, prevent the lock from opening. These pins are aligned properly only when the correct key is inserted. The key has a series of grooves on its side(s), and as it slides inside the cylinder, the horizontal grooves align with wards in the keyway, which then denies or g ives access to the cylinder. 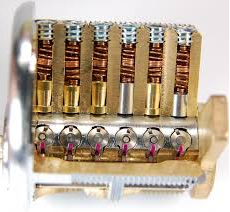 The keys blades have pointed notches and teeth, called bitings, which move the pins up and down till they are in line with the shear line of the inner and outer cylinder, (the shear line is where the inner cylinder (the plug – what you put your key in to) ends and the outer cylinder (the housing) begins) allowing the cam or the tailpiece to rotate freely and the lock to open. Exit Devices are also referred to as Crash Bars. They are also called panic exit devices, panic bars or push bars. Exit Devices replace handles, door knobs, levers etc., and are used for quick egress out of a building. They were originally built to be used in places prone to stampedes and panic, but are now widely installed to open doors in commercial buildings. 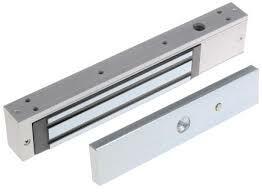 Exit Devices consist of a horizontal bar which has a spring loaded inside. When this bar is pressed (depressed), a mechanism unlatches the door, and occupants can then exit the building. There are instances wherein exit devices may be left unlocked through dogging. Dogging is the process of retracting the latch with a key so that it remains unlatched, allowing free egress by just pushing either the bar or any part of the door. Dogging an exit device of a crowded storefront during business hours will help to ease movement of visitors in and out of the store. Exit devices come in different models, so that they can be used on different types of doors. Wide Stile exit devices have a chassis which is generally more than two inches wide and can be used on doors having wide stiles (the vertical part of the door frame), while Narrow stile exit devices which can be installed on narrow stile doors have a chassis which is generally less than two inches wide. Exit devices can also be specified for use on fire doors. These types of exit devices are generally more expensive than normal panic exit devices, and are tested for use in both panic and fire conditions. The fire exit devices are installed on fire doors and these devices will have a fire label displayed prominently. The difference between fire exit devices and normal panic devices is that fire rated devices do not have mechanical dogging, as the exit devices lock mechanism should be allowed to be latched during a fire. This is done through electrified dogging which is connected to the fire alarm and releases the dogging mechanism enabling the exit device's latch to be latched in case of a fire. Rim Exit Devices - The Rim Exit Devices are the most common type of exit devices. The Rim Exit Devices have a surface mounted latch which slides over a strike. When the push bar is pressed, the latch retracts out of the strike. 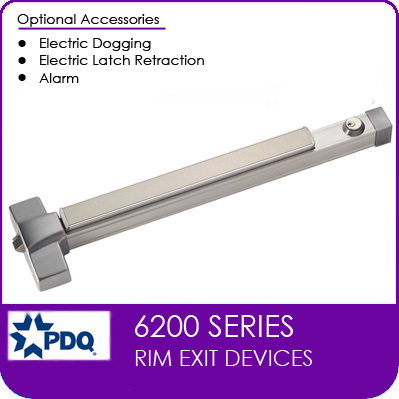 The rim exit devices are available for use on hollow metal doors, wood doors and narrow stile doors. 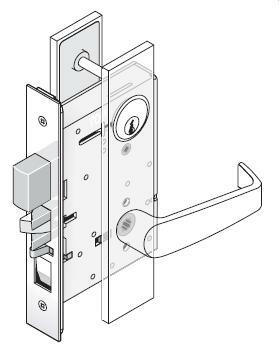 Mortise Type Exit Devices - Mortise Exit Devices have a mortise lock built into the door pocket. Pushing the panic bar causes the latch to retract, allowing door to swing outside. The mortise lock exit devices can also be equipped with exterior trim containing lock cylinder. 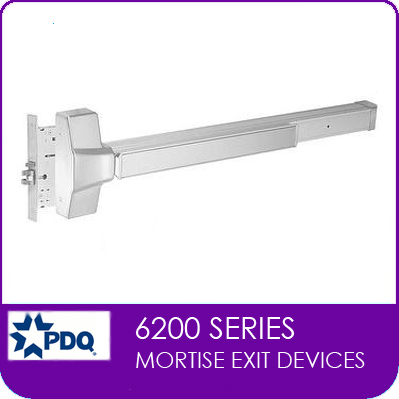 These exit devices can be used on both single and double doors, but it is more beneficial to install them in double doors, where the mortise lock is installed in the active leaf, while the inactive leaf contains a vertical rod exit device to secure the doors. Mortise type exit devices are available for wood, hollow metal doors and narrow stile doors. Surface Vertical Rod Exit Devices - Surface Vertical Rod Exit Devices have both top and bottom latches, which are connected to a push bar through vertical rods. The top latch deadlatches around a header strike, interlocking door to frame. Generally available for hollow metal and wood doors. 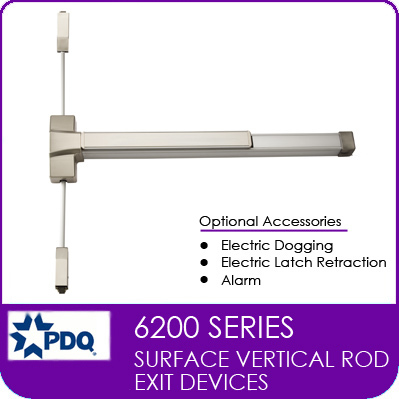 Variations of the Surface Vertical Rod Exit Devices include Surface Vertical Rod Exit Devices with Top Rod only. 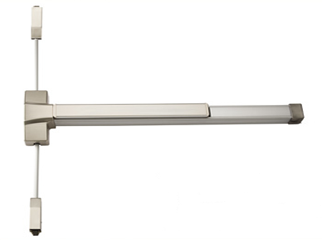 Different models of the Surface Vertical Rod Exit Devices work for single or double doors. Models that fit on narrow stile doors are also available. 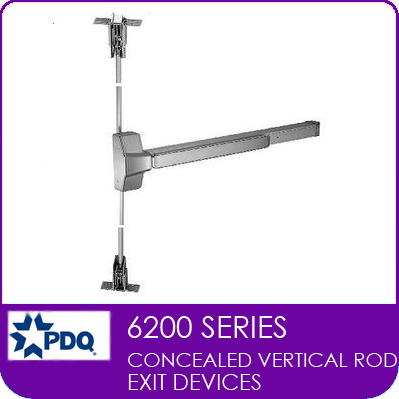 Concealed Vertical Rod Exit Devices - The Concealed Vertical Rod Exit Device is a type of exit device in which the vertical rod connecting the push bar to the top latch is replaced by a cable, and another cable connects the top latch to the bottom latch. High security locks are designed to provide an additional measure of security against break-ins. These locks come with additional features and characteristics that increase their resistance to forced entry. Some common methods used to forcefully pry open a lock include, picking, drilling, prying and even trying to break a lock with a sledgehammer, and high security locks provide additional measures to combat these methods of attack. One of the first steps lock manufacturers take to make a lock high security, is by using high quality materials such as brass, or hardened steel to make the lock. Using such heavy duty material, delays, or might even prevent someone who is using a sledgehammer to break a lock, to get in. Deadbolts are considered more secure than normal latch locks. Now even deadbolts are being manufactured with additional security features. They are being built using high quality, resistant material such as hardened steel, which makes the deadbolt almost impossible to break. High quality deadbolts might also come with ball bearings. As the deadbolt starts to throw into the strike, the ball bearings are pushed out of the bolt-locking it into the strike which contains a steel cup which captures and locks the bearings and bolt into the strike. For someone trying to pry the deadbolt, these ball bearings provide significant barrier. Drilling a lock is another commonly used technique employed for breaking in. 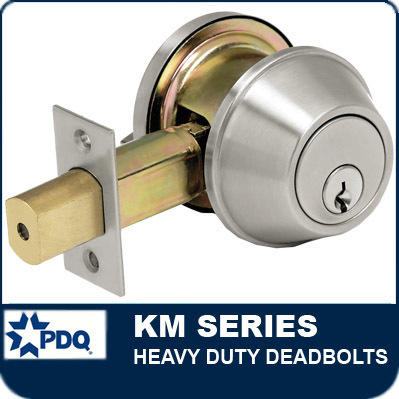 High security locks prevent or delay drilling by using heavy duty materials such as hardened steel, or ball bearings to provide protection in areas of the locks which are more prone to be drilled such as pins in the keyway or bolts which hold the lock together. Another way high security locks make it difficult to break-into, is by adding additional security in the keyway of the lock cylinder. Using complex keyway designs which restrict entry of tools or make it harder to insert tools is employed in high security locks. As you know, when a key slides into the keyway, pins in the keyway have to align themselves at the shear line. Placing these pins inside additional pins, is an approach used to prevent picking. For someone trying to pick open a lock, using additional pins translates into picking two locks. 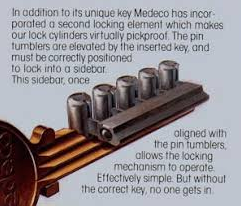 High Security locks might provide additional sidebar finger pins, which when the key is inserted, have to align themselves with the sidebar legs. So now someone trying to pick a lock will have to pick three locks at the same time. 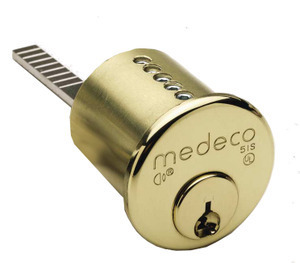 High security locks such as those made by Medeco have pins that rotate as well as go up and down. 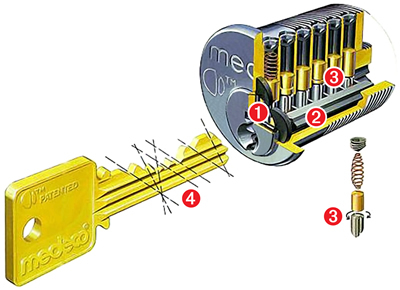 The figure on the right is an example of a Medeco high security lock. You will notice that the cuts on the key are cut at an angle (#4), and that the pins have a chisel point, which allows them to rotate. This exponentially increases key combination and pick resistance. Also, as seen in the image below, the double locking feature "increases security" and pick resistance even further. High security locks also have complicated keys, which are extremely hard to duplicate, requiring expensive machinery. If you go to an authorized dealer for duplicating a high security key, chances are that you will have to present a security card for duplicating the key. 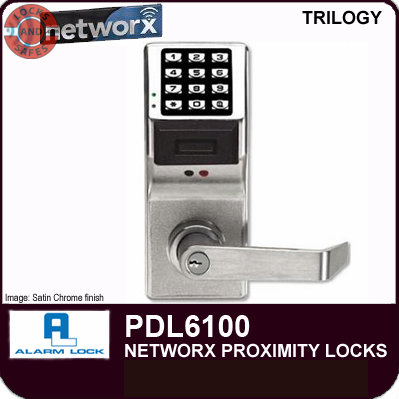 Access control locks are generally electronic digital battery operated locks. 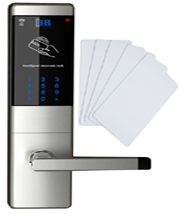 At the core, the access control lock is a traditional mortise or cylindrical lock, which come with a digital keypad, and/or a proximity sensor. For users to unlock the door, rather than using a key, they enter a pin code at the keypad or scan a proximity credential, such as a HID proximity ID card or a keyfob at the proximity sensor. So now, instead of issuing keys, users are assigned pin codes and/or given a proximity credential, which they can enter at the lock to gain entry. This leads to significant savings of time, money and manpower that would otherwise have been required in issuing/managing keys and in re-keying locks in case of lost or stolen keys. Apart from reducing key dependency, advanced versions of these locks also provide functionality such as scheduling automatic lock/unlock events, for example scheduling locking/unlocking event for holidays or weekend for your office. These locks also keep an audit log of door activity made by users, which can be retrieved and printed for record keeping purposes. To conduct these tasks, the access control locks generally come with a non-volatile memory and information such as user access information, scheduled events information and audit logs are stored at the lock itself. It is generally easy to program these locks. These locks can be programmed through the computer, and the privileges can be transferred to the lock using a USB key or directly from the computer itself, using a PC interface cable. These locks can also be programmed at the door itself, but this process might take longer than bulk transfer from the computer. Even more advanced access control solutions allow multiple standalone access control locks to be connected together in a network, all communicating wirelessly with a networked PC/server. Now tasks, such as changing user access code information and scheduling events can be performed wirelessly from the remote PC. Further, audit logs can also be retrieved remotely from the networked PC. So, even more savings are achieved due to elimination of door-to-door programming of user codes and physical retrieval of audit logs from the lock. The networked access control solutions generally have additional security features such as deploying a global lockdown of all locks in the network, in case of an emergency which can be performed either from the networked PC, or from any lock in the network. Biometric Locks come with a thermal or optical scanner and require a fingerprint scan to unlock the door to give access to a restricted area. 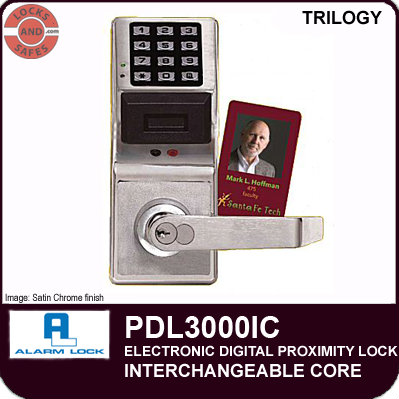 Biometric locks generally require a battery or a power supply to operate the lock. 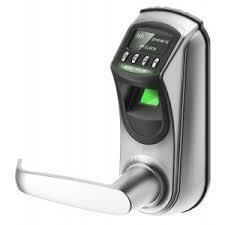 Different biometric locks employ different technologies through which they scan and verify fingerprints. Biometric locks with optical scanners essentially take a picture of your fingerprints and store this picture for matching. These optical scanner locks can be deceived by presenting a picture of your fingerprints. Biometric locks with capacitor scanners make an electronic mold of your fingerprints. Again, the capacitor scanner locks can be deceived by presenting a mold of your fingerprints. The most secure type of scanning technology is the ultrasound scanner which use sound waves to penetrate the outer layer of your skin to read the fingerprints from the inner layer. These are the hardest to deceive. Generally biometric locks require Multi Factor Authentication, i.e. a user has to present more than one valid credential to unlock the door. For example a Two factor authentication means that after using fingerprints a user might be required to enter a pin code at the lock itself. In case either of the two credential is invalid, the lock will not give entry. Like with other advanced access control solutions, biometric locks are more convenient than traditional locks, as you do not have to issue keys, or worry about lost keys, or keys being duplicated. As a backup mechanism, the biometric locks can come with a fail-safe key, but that is mostly used in case the battery on the lock dies, or the power supply is interrupted. Biometric locks are very tough to deceive, since they scan a person's unique fingerlines which are hard to replicate. Also, these locks generally perform the match at the lock itself, rather than verifying data from an external source, thereby limiting data exposure and its chances of being hacked. Another great feature of these locks is that they lock automatically after a specified amount of time (usually in seconds), after a door closes, so you do not have to worry about forgetting to lock the door. These locks generally come with a very handy monitoring tool, that of keeping an audit log of all lock activity. A built-in real time clock gives more authenticity to the audit log by date/timestamping the logs. As with any lock, if the underlying hardware has defects in its quality or make, this makes the lock more susceptible to tampering. The same is the case with biometric locks. Another issue that these locks have is if there is a defect in the software that powers these locks, then this makes the locks more susceptible to hacking. Lastly as a backup, the locks allow access with a key also, and if this key falls into the hands of an unauthorized person, then that person will be able to break-in. Look for the material made to build the lock - locks made of steel or brass are sturdier than locks made of Aluminium. 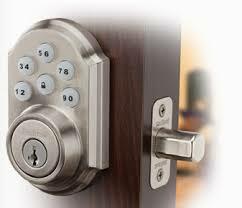 Look for a Biometric lock with Deadbolt which provides higher security. Look for the False Rejection Rate or the rate at which a lock rejects a valid fingerprint credential. You want a lock with a low False Rejection Rate. For high security areas, a Multi Factor Authentication is a good idea. Look for the fingerprint technology being used by the lock. The lock industry is not immune to technological advancements. Apart from fingerprints, biometric locks which rely on other human physiological identifiers such as voice, retina and facial recognition have been developed. Safe locks mostly consist of combination locks. These locks generally accept a sequence of numbers, mostly three or four sequences to form a combination code. The code is entered by turning a dial. Once the correct code is entered, the safe handle can be turned to open the safe door. Apart from the dial, the combination lock consists of several discs or cams. To open the lock, the dial is first rotated in one direction for the first numeral, in the opposite direction for the second numeral and continues alternating till the last numeral is reached. The discs have a notch in them, and as the correct numeral is entered, these notches align themselves to allow a latch to fit into them. The lock opens after the latch fits all the discs. Historically, mechanical combination locks have been used to protect safes. But now, with technological advances digital electronic battery operated combination safe locks, featuring digital keypads or biometric fingerprint scanners are also being used. The advantages of using a digital keypad combination lock is that they are more secure than mechanical combination locks. A person trying to break into a safe cannot just spike (take out the keypad and join the wires) the lock to open it. Further, digital keypad locks generally have additional security features such as if a person enters incorrect combinations for a specified number of tries, the lock will shutdown for a specified amount of time. Also, it is easy to change the combination of a digital keypad combination lock. On the other hand, for changing the combination of a mechanical combination lock, you will have to hire a locksmith. 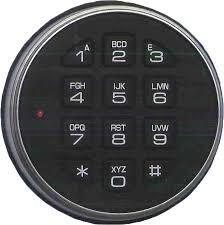 Another great advantage of a digital keypad combination lock is that it is possible to assign different users individual access codes, whereas in a traditional mechanical combination lock, you will have to share your combination code with all persons whom you want to give access to. 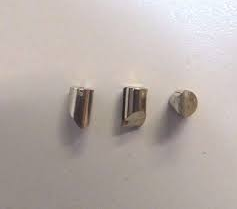 Magnetic Locks or Electromagnetic Locks consist of a magnet and an armature plate. An electric current is passed to the magnet, which creates a magnetic flux. This magnetic flux attracts the armature plate to the electromagnet creating a locking solution. Magnetic locks are a type of 'fail safe' locking device, i.e. they work till power is supplied to them. In case of power interruption, the lock stops working. Generally, electromagnetic locks create a powerful force with the armature plate, which is able to withstand high stress. When installing a magnetic lock, typically, the armature plate is mounted on the door and the electromagnet is mounted on the door frame. Magnetic locks are not ideal for high security solutions, since if the power is cut off the lock stops working. A workaround for this is to add a magnetic bond sensor to the lock and providing a battery backup to the. On the other hand, a great use of magnetic locks is in emergency door locks for fire applications. Fire codes stipulate that a release hardware which interrupts power supply for a short time period (typically 15-30 seconds) be mounted near the door. Pressing this button will allows people to exit. An additional release hardware, which could be a motion sensor, or a switch in a crash bar might also be required by fire code. Pressing this switch will allow automatic unlocking from the exit side of the door. Magnetic locks have both advantages and disadvantages. 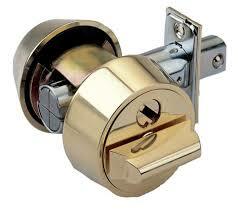 Magnetic locks are generally more expensive than standard mechanical locks. Requirements of additional hardware to operate the locks might increase their cost even more. Also, as discussed before, disruption in power supply will unlock the door which might compromise security. On the other hand, magnetic locks are easy to install, and they do not have any interconnected parts. They also unlock almost instantly, as soon as power is interrupted, which makes them quick to operate.